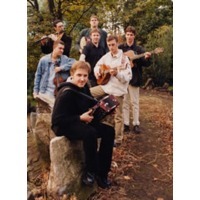 Danú is an Irish traditional music band. The members of Danú met in Waterford in Southeastern Ireland in 1994. After performing in the Festival Interceltique de Lorient in 2005, the then thrown-together group decided to consolidate as a band. They are devoted to their traditional roots, but unafraid to experiment with arrangement, with critics commenting that their music exudes energy and empathy. Their second album, Think Before You Think (2000) was voted Best Overall Traditional Act by Dublin's magazine Irish Music. They have been voted Best Traditional Group twice in the BBC Radio 2 Folk Awards, the only band to achieve such a feat. Their version of Co. Down (written by Tommy Sands) won Best Traditional Song in the same awards.